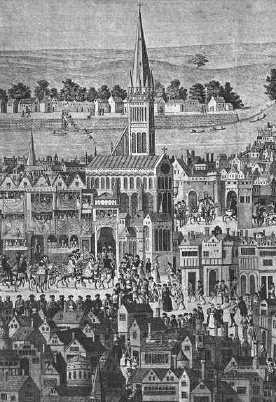 A procession into London's St. Paul's. University of Victoria Library. See the procession in full. ...the brewers for the more part remain near to the friendly water of the Thames; the butchers in Eastcheape, St. Nicholas shambles, and the Stockes market; the hosiers of old time in Hosier lane, near unto Smithfield, are since removed into Cordwayner street [...] labourers every work-day are to be found in Cheape, about Soper's land end; horse-coursers and sellers of oxen, sheep, swine, and such like, remain in their old market of Smithfield. Outside the city walls were London's suburbs. The populations of both the eastern and western suburbs grew steadily. While the west was inhabited mostly by the wealthy wishing to be close to Westminster Palace (the royal court), the eastern suburbs were home to poorer folk. One of the most visited spots of the city was Deptford. It was here, in 1581, that Queen Elizabeth boarded The Golden Hind to knight its captain Francis Drake, the first Englishman to sail round the world. Another rather more macabre spot of attraction was the Execution dock, which lay outside the city walls in the precinct of Wapping. Here pirates were publicly hanged*. The Tower of London was an important city landmark. It served as a "royal place for assemblies, and treaties," as a prison "for the most dangerous offenders" and was also "treasury of the ornaments and Jewels of the crown" (Stowe 55). Many of Shakespeare's plays were performed in front of Elizabeth and James I in The Great Chamber at Whitehall Palace, once home to Cardinal Wolsey, Archbishop of York. Whitehall, previously known as York Place, is frequently referred to in Shakespeare's history plays*. Westminster Abbey was the coronation place of the Kings and Queens of England. Westminster Hall was the "king's principal palace" (Stowe 412) and a court of law. Richard II rebuilt the Hall, and in an ironic twist of fate, was himself the first to be tried in the newly erected building. London as Shakespeare would have known it has largely been lost as a result of the Great Fire of 1666, which destroyed the greater part of Tudor London. Luckily, maps of Tudor London have survived; two maps by John Norden, of Westminster and London (1593) have proven particularly helpful. John Stowe's Survey of London is generally regarded as the most reliable primary source* about the subject. the usual place of execution for hanging of pirates and sea rovers, at the low-water mark, and there to remain, till three tides had overflowed them, was never a house standing within these forty years; but since the gallows being after removed farther off, a continual street, or filthy strait [narrow] passage, with alleys of small tenements, or cottages, [has been] built, inhabited by sailors' victuallers, along by the river Thames, almost to Radcliff, a good mile from the Tower. John Stowe was a contemporary of Shakespeare. A tailor in his youth, Stowe later joined the Society of Antiquaries and began to collect historical documents and manuscripts. Besides his Survey of London, Stowe also wrote The Annales of England (1580) and produced an edition of Holinshed's Chronicles. His Survey was re-issued and updated by John Strype in 1720.